Cell adhesion mediated by the CD11/CD18 integrins and their ligands, the ICAMs, is required for many leukocyte functions. In resting cells the integrins are nonadhesive, but when activated they become adhesive for their ligands. Previous findings have shown that a peptide derived from the first Ig domain of ICAM-2 (P1) binds to LFA-1 (CD11a/CD18) and Mac-1 (CD11b/CD18) and activates leukocyte aggregation. Because its mechanism of action has remained poorly understood, we have now studied the peptide-induced ligand binding in detail. Here we show that P1 was able to induce CD11/CD18-dependent adhesion of human T lymphocytes to immobilized, purified ICAM-1, -2, and -3. The optimal peptide concentration was 150 μg/ml, whereas concentrations higher than 400 μg/ml did not have any stimulatory effect. The increase in adhesion was detectable within 10 min of treatment with the peptide; it was dependent on energy, divalent cations, temperature, and an intact cytoskeleton but was unaffected by protein kinase C and protein tyrosine kinase inhibitors. Peptide treatment resulted in strong stimulation of the binding of soluble, recombinant ICAMs to T lymphocytes, showing that the integrin affinity toward its ligands was increased. Importantly, soluble ICAM-2Fc was also able to induce T lymphocyte adhesion to purified ICAM-1, -2, and -3, and it was a more potent stimulatory molecule than ICAM-1Fc or ICAM-3Fc. The leukocyte-specific β2 integrins (CD11/CD18) consist of four heterodimeric glycoproteins with specific α-chains (CD11a, -b, -c, -d) and a common β2-chain (CD18). They play an essential role in mediating diverse cell-cell interactions required for many leukocyte functions, such as the production of Ig, phagocytosis and chemotaxis, cytotoxicity of T lymphocytes and NK cells, and leukocyte extravasation through capillary endothelium (1, 2, 3, 4, 5). CD11a/CD18 (LFA-1, αL/β2)3 is expressed on all leukocytes. CD11b/CD18 (Mac-1, αM/β2) is mainly expressed on cells of the myeloid lineage, whereas CD11c/CD18 (p150/95, αX/β2) is considered a good marker for mononuclear phagocytes. The most recently found member of the β2 integrin family, CD11d/CD18 (αd/β2), is expressed on myelomonocytic cell lines and subsets of peripheral blood leukocytes. CD11d is more closely related to CD11b and CD11c than to CD11a (6). A 200-residue I (inserted) domain has been identified at a similar location in the α subunits of the β2 integrins. The leukocyte integrins mediate adhesive functions through this domain. The I domains contain no cysteine residues or N-linked glycosylation sites, but cysteines are usually found at their boundaries. These two features may allow accessibility to ligands and flexibility to adopt variable conformations (7). The β2 integrins mediate cell adhesion through binding to the ICAMs. At present, five human ICAM molecules have been described, namely ICAM-1 (CD54), ICAM-2 (CD102), ICAM-3 (CD50), ICAM-4 (LW blood group Ag), and ICAM-5 (telencephalin) (see 5). ICAM-1 consists of five Ig-like domains, is found on the surface of leukocytes and various other cells, and can be up-regulated by numerous proinflammatory cytokines (1, 5, 8). ICAM-2 has two Ig-like domains; it is expressed on endothelial cells, various leukocytes, and platelets (9); and it is refractory to commonly used proinflammatory cytokines (10, 11). ICAM-3 is composed of five Ig-like domains, and it is present at high levels on resting lymphocytes, monocytes, and granulocytes. It is the only ICAM significantly expressed on neutrophils (12). ICAM-4 is RBC specific (13), and ICAM-5 is confined to the brain (14, 15). The ICAMs may also exist in soluble forms in human plasma, which may result from postactivation proteolytic mechanisms at the cell surface of various cells (16, 17, 18). CD11a/CD18 is able to bind all five ICAM-molecules. The NH2-terminal domains of ICAM-1, ICAM-2, and ICAM-3 are evidently most important for binding (11, 19, 20, 21, 22, 23, 24, 25). CD11b/CD18 binds ICAM-1, ICAM-2, and ICAM-4. The third Ig-like domain in ICAM-1 (26) and the first NH2-terminal domain in ICAM-2 seem to be important for CD11b/CD18 binding (22). CD11b also binds to several soluble ligands including the complement fragment iC3b, fibrinogen, and factor X (27, 28). CD11c/CD18 binds ICAM-1, but also to iC3b and fibrinogen. CD11d/CD18 exhibits preferential recognition of ICAM-3 (6). Integrins alternate between states of low and high affinity and avidity for their ligands. The mechanisms underlying the transitions between the different states are still incompletely known. Integrins can be activated in a variety of ways. Activation through the TCR complex (29, 30) or directly by the protein kinase C (PKC)-activating phorbol esters (31, 32) occurs through inside out signaling. CD11/CD18 activation can also be induced by specific mAbs against a number of other cell surface molecules like CD2 (29), CD43 (33), and CD44 (34, 35). The cellular signaling events leading to integrin activation in each case may be at least partially different. Some reagents, like the divalent cations Mg2+ and Mn2+, and some integrin-binding mAbs, such as MEM83 (36), KIM127, and KIM185 (37, 38, 39), may induce integrin activation without the need of intracellular signaling. We have earlier described a synthetic 22-amino acid peptide (P1) corresponding to a sequence from the first Ig domain of ICAM-2 that is able to bind to CD11a/CD18 and CD11b/CD18 and stimulate the aggregation of various leukocytes. Furthermore, it also stimulates the migration and cytotoxicity of NK cells (40, 41, 42). Its mechanism of action has, however, remained elusive. Here we have studied in more detail how the P1 peptide acts. The results show that it stimulates CD11/CD18-dependent adhesion of T lymphocytes to purified immobilized ICAM-1, -2, and -3 with the optimal concentration of 150 μg/ml for activation. P1 induced increased integrin affinity for ICAMs, as shown by an increased binding of soluble forms of ICAMs to T lymphocytes. Like P1, purified ICAM-1, ICAM-2, and ICAM-3 were all able to stimulate the T lymphocyte adhesion to immobilized ligands, but ICAM-2 was found to be the most efficient stimulatory ICAM. mAb 7E4 against the CD18 subunit of CD11/CD18 has been described previously (43). mAb OKT3, which reacts with CD3, was used in the form of ascites fluid (Clone CRL 8001; American Type Culture Collection, Rockville, MD). Human T lymphocytes were isolated from buffy coats obtained from the Finnish Red Cross Blood Transfusion Service as described (44). Cells were suspended to a density of 106 cells/ml in RPMI 1640 medium supplemented with 10% FCS, l-glutamine, and antibiotics and kept in culture overnight at 37°C. Cellular ICAM-2 and CD11a/CD18 were isolated from human buffy coat cell lysates from 200 U of blood as previously described (22, 45). The ICAM-1Fc, ICAM-2Fc, ICAM-3Fc, and NCAMFc (neural cell adhesion molecule fused to the Fc portion of IgG) fusion proteins were produced by transient transfection of COS-1 cells and isolated from the culture supernatants by protein A-Sepharose affinity chromatography as described (46). Their purities were checked by SDS-PAGE (47). The ICAM-1Fc, ICAM-2Fc, ICAM-3Fc, and NCAMFc cDNA vectors were kindly provided by D. L. Simmons. Soluble ICAM-1 (sICAM-1) and ICAM-3 consisting of the extracellular parts of the molecules were obtained from Dr. W. M. Gallatin (ICOS, Bothell, WA). ICAM-1Fc fusion protein for competition assay was produced using the CHO K-1 cell line (48) and purified from the cell culture supernatant by protein A-Sepharose affinity chromatography. The ICAM-2-derived peptide P1 (GSLEVNCSTTCNQPEVGGLETSY) and the scrambled control peptide P8 (EVGTGSCNLECVSTNPLSGTEQY) were synthesized by fluorenylmethoxycarbonyl chemistry as described (22, 40), and their structures were verified by mass analysis. Purified ICAM-1, ICAM-2, ICAM-3, or CD11a/CD18 were coated (0.3 μg/well) on flat-bottom 96-well microtiter plates by overnight incubation at 4°C. For coating, ICAM molecules lacking the Fc portions were used. The wells were blocked with 1% BSA for 90 min at 20°C. Aliquots (50 μl) of T lymphocytes (5 × 105 cells) suspended in binding medium (RPMI 1640, 40 mM HEPES, 2 mM MgCl2, 5% FCS) were added to each well and treated with the peptides, PdBu (Sigma Chemical, St. Louis, MO), OKT3, or ICAM/NCAM Fc fusion proteins. Pretreatments with NaN3 and deoxyglucose, EDTA, cytochalasin D (Calbiochem, La Jolla, CA), or herbimycin A (Calbiochem) were for 30 min, and for those for bisindolylmaleimide I (Calbiochem, La Jolla, CA) were for 90 min before the addition of peptides. After incubation for 1 h at 20°C, unbound cells were removed by gentle washing. The binding was quantitated by counting bound cells in four randomly chosen fields from each well using ×200 magnification. The results are expressed as mean ± SD. Purified CD11a/CD18 was coated on flat-bottom 96-well microtiter plate by overnight incubation at 4°C. The wells were blocked with 2% BSA for 30 min at 37°C. ICAM-1Fc (0.33 μM), 50 μl in PBS/2 mM MgCl2, was then added to the wells in duplicate in the presence or absence of the peptides or DTT (Sigma). After incubation for 1 h at 20°C, the wells were washed, and 50 μl of rabbit anti-mouse Ig alkaline phosphatase conjugate (Dako, Copenhagen, Denmark) diluted 1:2000 in 1% BSA/PBS/2 mM MgCl2 were added to each well and incubated for 30 min at 37°C. After washing, 50 μl of p-nitrophenyl phosphate (1 mg/ml) (Sigma) in 50 mM diethylamine (Fluka Chemie AG, Buchs, Switzerland), pH 10, 0.5 mM MgCl2 were added to each well, and the plates were incubated at 37°C for 45 min. The absorbance was then measured using a Titertek Multiskan plate reader (Eflab Oy, Helsinki, Finland) at 405 nm. T lymphocytes were washed three times with 20 mM HEPES, 140 mM NaCl, and 2 mg/ml glucose, pH 7.4. Cells (5 × 105) were incubated in 25 μl of this buffer supplemented with indicated MgCl2 concentrations in the presence or absence of stimulators and 400 μg/ml of ligand protein at 37°C for 60 min. After removal of the unbound ligand by washing with PBS, the cells were incubated with 10 μg/ml FITC-conjugated anti-human IgG-Fc specific Abs (Jackson Immunoresearch Laboratories, West Grove, PA) on ice for 20 min, washed, and analyzed with a Becton Dickinson FACScan flow cytometer (Immunocytometry System, Mountain View, CA) (49). In a similar way, the binding of mAb 24 was studied, using FITC-conjugated rabbit anti-mouse F(ab′)2 (Dako) as a secondary Ab. It was earlier shown that peptide P1 induced the aggregation of various leukocytes (22, 40, 41). We have now studied the mechanism of P1-induced adhesion in more detail. 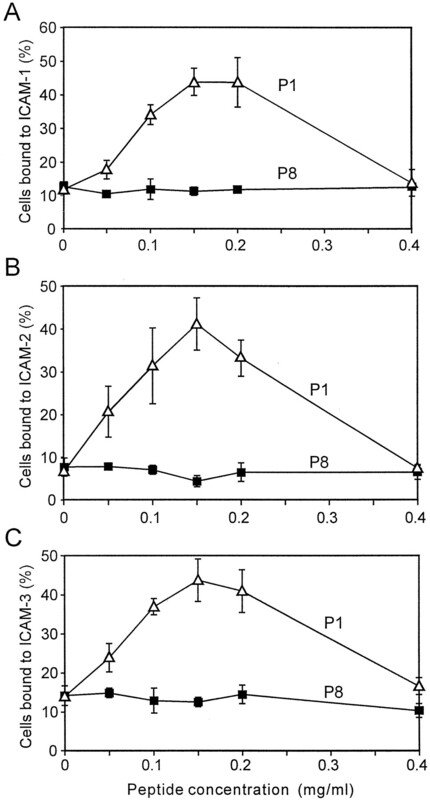 Treatment of human T lymphocytes with P1 stimulated adhesion of the cells to purified, immobilized ICAM-1, -2, and -3, and most efficiently to ICAM-1 (Fig. 1⇓). The adhesion was CD11/CD18 dependent as shown by inhibition of the adhesion with the blocking mAb 7E4. Adhesion of T lymphocytes to purified ICAM-1, -2, and -3 induced by P1 peptide. T lymphocytes were incubated with 150 μg/ml P1 in the presence or absence of 40 μg/ml anti-CD18 (R7E4) in ICAM-1-coated microwells at 20°C for 1 h, and the number of bound cells was counted. The results are given as percentage of cells bound to ICAM-1. The white bars represent untreated cells. P8-treated cells gave results similar to those of untreated cells (CTRL). The background binding to BSA was 5–10%. The experiment was repeated three times with similar results. We further studied the kinetics of the peptide induced activation. As can be seen in Fig. 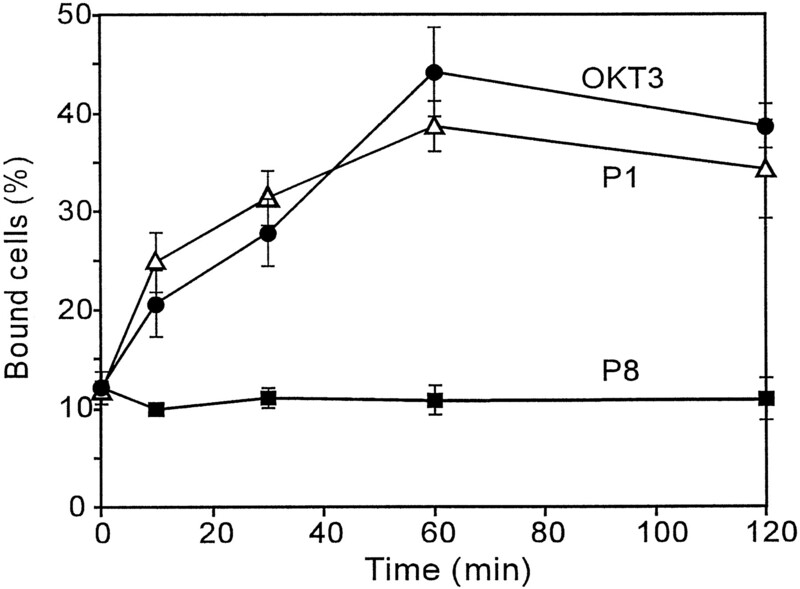 2⇓, the effect of the peptide on the adhesion to ICAM-1 was detectable after a 10-min treatment, and it reached a maximum in 1 h. Importantly, OKT3 activation of cells showed similar kinetics. The scrambled control peptide P8 had no effect. Similar kinetics was observed when ICAM-2 or -3 were coated (not shown). Kinetics of T lymphocyte adhesion to ICAM-1. T lymphocytes were treated with 150 μg/ml P1 or P8 or 1:200 diluted OKT3 mAb ascites for the indicated times at 20°C, and the cells bound to ICAM-1 were counted. The effect of different P1 or P8 concentrations on the adhesion of T lymphocytes to purified ICAM-1 (Fig. 3⇓A), ICAM-2 (Fig. 3⇓B), and ICAM-3 (Fig. 3⇓C) was studied. In Fig. 3⇓, it can be seen that low P1 concentrations were stimulating and that the optimal stimulatory P1 concentration was ∼150 μg/ml. Importantly, concentrations of 400 μg/ml or above did not stimulate adhesion. The P1-induced T lymphocyte activation showed a similar dependence on peptide concentrations with ICAM-1, -2, and -3. The control peptide P8 had no effect. Effect of different peptide concentrations on the binding of T lymphocytes to purified ICAM-1 (A), ICAM-2 (B), and ICAM-3 (C). T lymphocytes were activated with indicated peptide concentrations for 1 h, and the cells bound to the coated proteins were counted. Fig. 4⇓A shows that the P1-induced binding of T lymphocytes to coated ICAM-1 did not take place at low temperature and that it was blocked by pretreatment of the cells with sodium azide and deoxyglucose or with EDTA. Similar results were obtained with immobilized ICAM-2 or -3 (not shown). Inhibition of induced adhesion of T lymphocytes to immobilized ICAM-1. T lymphocytes were kept at 4°C or pretreated with 0.2% NaN3 and 50 mM 2-deoxyglucose (DG) or 5 mM EDTA before the addition of 150 μg/ml P1 (A). In B the cells were pretreated with 0, 1, 5, 10, or 20 μM cytochalasin D before the addition of 150 μg/ml P1 or P8 or 60 nM PdBu. The cells bound to ICAM-1 were counted after a 1-h incubation. Pretreatment of T lymphocytes with cytochalasin D, which inhibits actin polymerization, inhibited the P1- and PdBu-induced adhesion of the cells to ICAM-1 (Fig. 4⇑B). The inhibitory effect could be seen when the cytochalasin D concentration was 1 μM, but when used at concentrations of 5 μM and above, the effect was stronger. Preincubation of T lymphocytes with increasing concentrations of the PKC inhibitor bisindolylmaleimide I (Fig. 5⇓A) or the protein tyrosine kinase inhibitor herbimycin A (Fig. 5⇓B) did not inhibit the P1-induced adhesion of the cells to ICAM-1. 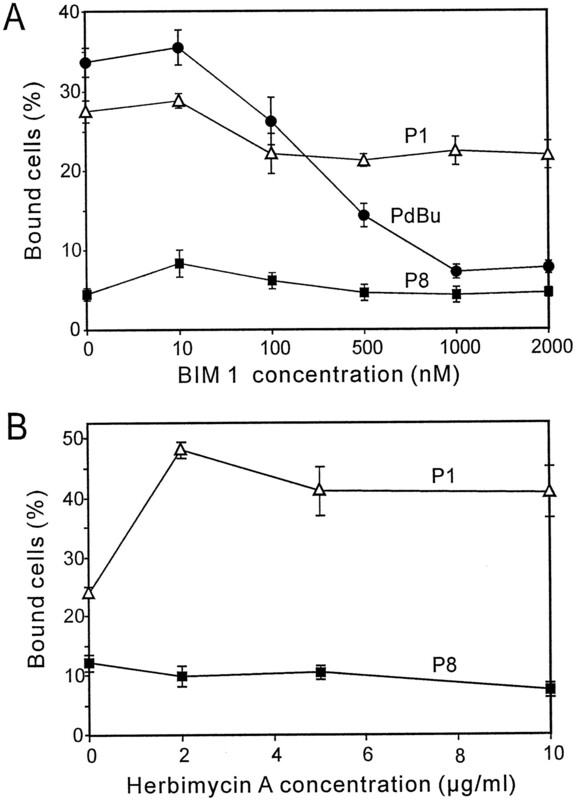 As expected, the PdBu-induced adhesion was efficiently inhibited by bisindolylmaleimide I. Effect of bisindolylmaleimide 1 (BIM 1) and herbimycin A on the P1-, P8-, or PdBu-induced T lymphocyte adhesion to immobilized ICAM-1. The cells were pretreated with the indicated concentrations of bisindolylmaleimide 1 (A) or herbimycin A (B) at 37°C for 30 min before addition of the activating agents. The bound cells were counted after 1 h of incubation at 20°C. To be able to study changes in integrin affinity, we wanted to measure the effect of peptide treatment on the binding of soluble integrin ligands to T lymphocytes. For this purpose, sICAM-1Fc, ICAM-2Fc, ICAM-3Fc, and NCAMFc fusion proteins were produced by transient transfection in COS cells and purified by affinity chromatography. The preparations contained the expected proteins, and no major impurities were observed (Fig. 6⇓). Polyacrylamide gels of purified ICAM-1Fc (A), ICAM-2Fc (B), ICAM-3Fc (C), and NCAMFc (D). Proteins were run on 8% polyacrylamide gels in the presence of SDS and stained with Coomassie blue. The positions of the m.w. markers are indicated. The binding of soluble Fc fusion proteins to T lymphocytes was studied by flow cytometry using a FITC-conjugated anti-Fc mAb to trace the Fc portions of the bound proteins. Fig. 7⇓A shows that the P1 peptide stimulated the binding of sICAM-1Fc to T lymphocytes, whereas the control peptide P8 or PdBu had no effect. No increase in binding of the control protein, NCAMFc, to the cells was observed (Fig. 7⇓B). The binding of sICAM-2Fc and ICAM-3Fc to the cells was also increased after peptide treatment (Fig. 7⇓C). Binding of soluble ligands to T lymphocytes after treatment with peptide or PdBu. T lymphocytes were incubated with 150 μg/ml P1 or P8 or with 60 nM PdBu in the presence of 400 μg/ml ICAM-1Fc, and the binding was determined by flow cytometry. The MgCl2 concentration used was 2 mM. The results are expressed as median fluorescence intensity. A, Mean and SD of six independent experiments. In B the cells were incubated without (control (CTRL) bars) or with 150 μg/ml P1 or P8 in the presence of 400 μg/ml BSA, ICAM-1Fc, or NCAM-Fc. The results represent means of median fluorescence intensities from two experiments. In C the binding of ICAM-1Fc, ICAM-2Fc, and ICAM-3Fc at 1.9 μM is shown. It has been shown that Mg2+/EGTA treatment of T lymphocytes induces significant binding of sICAM-1 by the same method (49), and this treatment was also used here as a positive control. According to our results, P1 is at least as efficient a stimulator of sICAM-1 binding as 10 mM Mg2+/1 mM EGTA, and in some experiments it turned out to be even more effective (results not shown). The results also suggest that the effect of P1 is clearly less dependent on the Mg2+ concentration. P1 worked very efficiently when the Mg2+ concentration was as low as 1 mM. The ability of P1 to induce the expression of the CD11a/CD18 activation reporter epitope recognized by mAb 24 was also tested by flow cytometry using T lymphocytes. In these experiments, 10 mM Mg2+/1 mM EGTA treatment was used as a positive control (49). P1 was not able to alter the expression of the mAb 24 epitope, whereas the effect of Mg2+/EGTA was obvious. The median fluorescence intensities were 10.8, 31.6, 8.1, and 7.6 using 0 mM Mg2+, 10 mM Mg2+/1 mM EGTA, 10 mM Mg2+/150 μg/ml P1, and 10 mM Mg2+/150 μg/ml P8 as stimulators, respectively. The experiments have been repeated with similar results. When the binding of sICAM-1 to purified CD11a/CD18 integrin coated on plastic was studied, no inhibition was observed in the presence of P1 up to a concentration of 4.1 μM (10 μg/ml) (Table I⇓). Higher concentrations were inhibitory, but P8 and DTT showed a similar effect. The results indicate that at higher concentrations the sulfhydryl groups become inhibitory. It was of interest to see whether also the ICAM-2 protein was able to stimulate adhesion. Fig. 8⇓ shows that treatment of T lymphocytes with sICAM-2Fc (0.27–0.67 μM) stimulated the adhesion of the cells to purified, immobilized ICAM-1 (Fig. 8⇓A), ICAM-2 (Fig. 8⇓B), and ICAM-3 (Fig. 8⇓C). 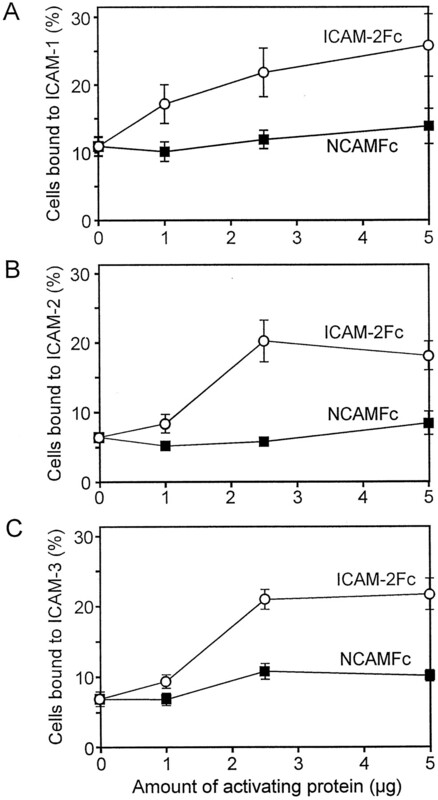 The percentage of bound cells after ICAM-2Fc stimulation was usually a little higher when ICAM-1 was coated compared with ICAM-2 or ICAM-3. NCAMFc had no significant effect on adhesion. T lymphocyte adhesion to purified ICAM-1 (A), ICAM-2 (B), and ICAM-3 (C) induced by sICAM-2Fc and NCAMFc. T lymphocytes were treated with indicated amounts of ICAM-2Fc or NCAMFc for 1 h at 20°C, and the bound cells were counted. The percentages of bound cells after activation of the cells with 62 μM P1 in the experiment shown in Fig. 6⇑ were 39%, 27%, and 33% for A, B, and C, respectively. 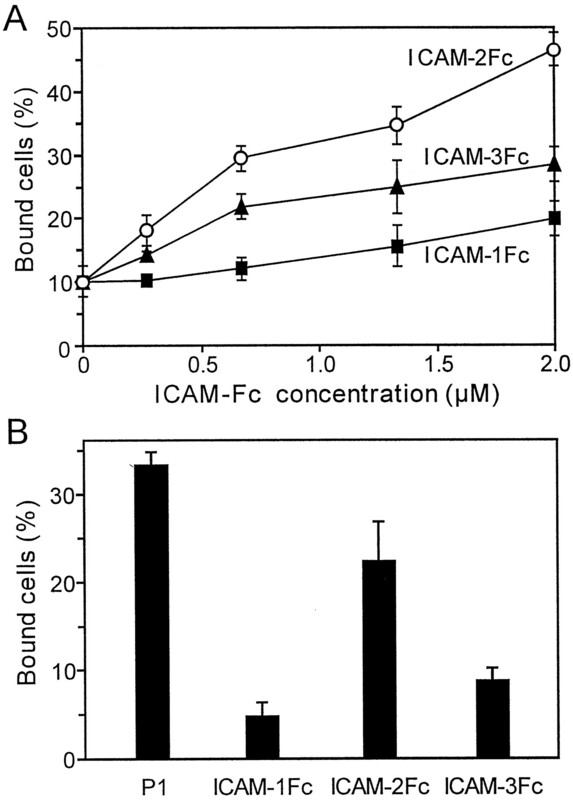 When the abilities of the different ICAMFcs to induce adhesion of T lymphocytes to purified ICAM-1 were compared, ICAM-2Fc appeared to be the most potent activator. ICAM-3Fc showed some activating effect while ICAM-1Fc had almost no activity (Fig. 9⇓A). Because of the possibility that the binding of the cells to immobilized ICAM-1 could be preferentially inhibited by sICAM-1Fc, we also tested the effect of the different sICAMs on binding of T lymphocytes to coated ICAM-2 (Fig. 9⇓B). The results show that the stimulation by ICAM-2Fc also in this case was stronger than that by ICAM-1Fc or ICAM-3Fc. T lymphocyte adhesion to purified ICAM-1 and ICAM-2 induced by sICAM-1Fc, ICAM-2Fc, and ICAM-3Fc. A, T lymphocytes were treated with indicated concentrations of sICAMFc for 1 h at 20°C, and the cells bound to immobilized ICAM-1 were counted. In B the wells were coated with ICAM-2, and the cells stimulated with P1 (62 μM), ICAM-1Fc (1.4 μM), ICAM-2Fc (1.3 μM), or ICAM-3Fc (1.4 μM). It is known that changes in integrin binding activity may occur without a change in receptor number. This could reflect an increase in the affinity of the integrins for ligand probably due to conformational changes. On the other hand, integrin clustering, multimerization, or redistribution in the plane of the membrane, such as that seen after phorbol ester treatment, also affects the ligand-binding ability by increasing integrin avidity (5, 50, 51, 52). Several different types of external ligands are known, which induce increased integrin activity, but despite much effort their mechanisms of action have remained poorly understood (5, 53). As a model compound, we have used a 22-amino acid peptide, P1, derived from the first Ig-like domain of ICAM-2, which binds to CD11a/CD18 and CD11b/CD18 and stimulates the aggregation of various leukocytes, and among other things increases the migration and cytotoxicity of NK cells (22, 40, 41, 42). In our earlier reports, the P1-induced integrin activation was monitored at the cellular level by increased aggregation of various leukocytes, and this interaction was shown to be largely CD11a/CD18-ICAM-1 dependent, as shown by using Abs to CD11a, CD18, and ICAM-1. Abs to ICAM-2 and ICAM-3 did not block the aggregation (22, 41). Now we have studied the P1-induced leukocyte integrin activation in more detail. Because of the complexicity when studying cell-cell interaction, we have used purified ICAMs. P1 induced T lymphocyte adhesion to all three plastic-coated ICAMs, and the interactions were CD11/CD18 dependent since the binding could be blocked with the CD18 mAb. 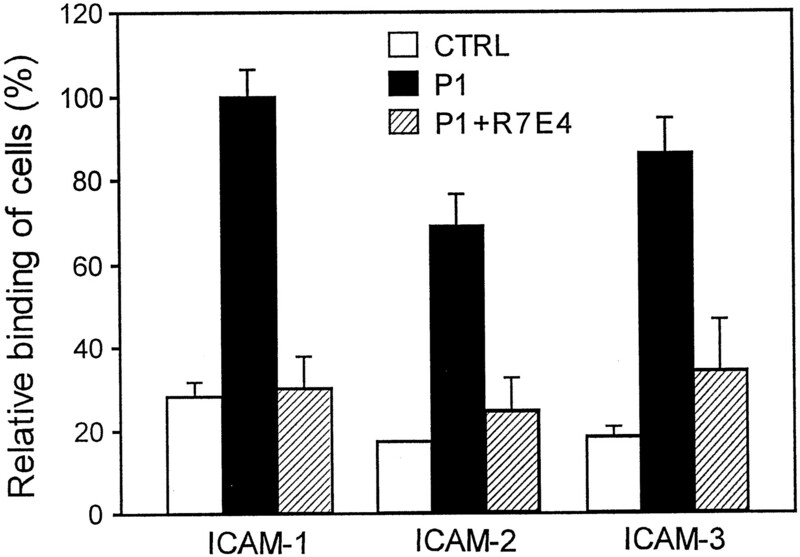 The amounts of bound cells were usually higher when ICAM-1 was coated as compared with ICAM-2 and -3. Interestingly, activating Abs against CD11a, such as MEM83 and NKI-L16, are incapable of inducing the CD11a/CD18-mediated adhesion of cells to all three ICAMs (54). The Ab MEM83 stimulated the binding of T lymphocytes to L cells expressing ICAM-1, while inhibiting the interaction of CD11a/CD18 with cells expressing ICAM-2 and -3. The Ab NKI-L16 selectively induced adhesion to ICAM-1 and -2, but not to ICAM-3. On the other hand, PdBu was able to enhance the adhesion of T lymphocytes to all immobilized ICAMs (35). The differential effects of the activating Abs may be due to the presence of different binding sites for ICAMs in the integrins (54). On the other hand, Woska et al. (55) have compared the binding of sICAM-1 and sICAM-3 with that of CD11a/CD18, and their data demonstrate that these two ICAMs share a common or an overlapping binding site on CD11a/CD18. Instead they found that the affinity of the sICAM-3/CD11a/CD18 interaction is 9–10 times weaker than the sICAM-1/CD11a/CD18 interaction. 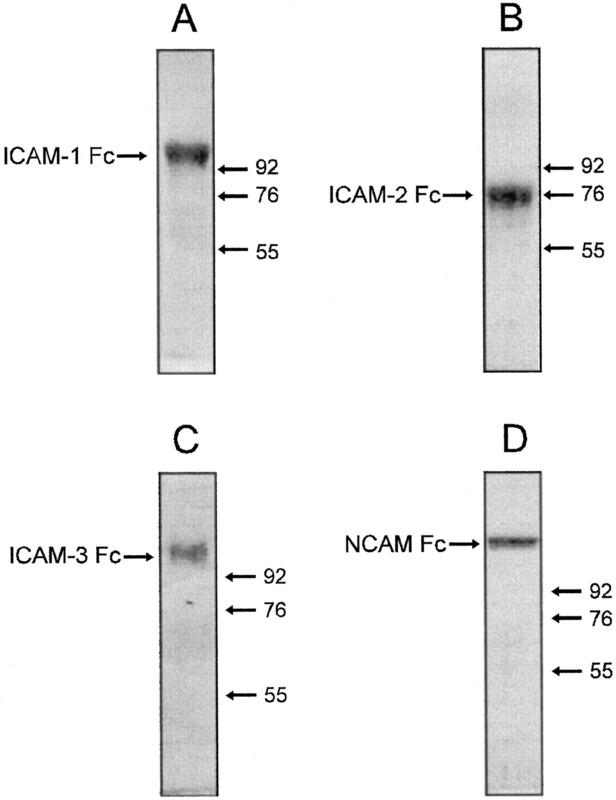 Therefore, the apparent differences in the binding sites for ICAMs in the integrins found in some reports could be attributed to these different affinities of ICAMs for β2 integrins. 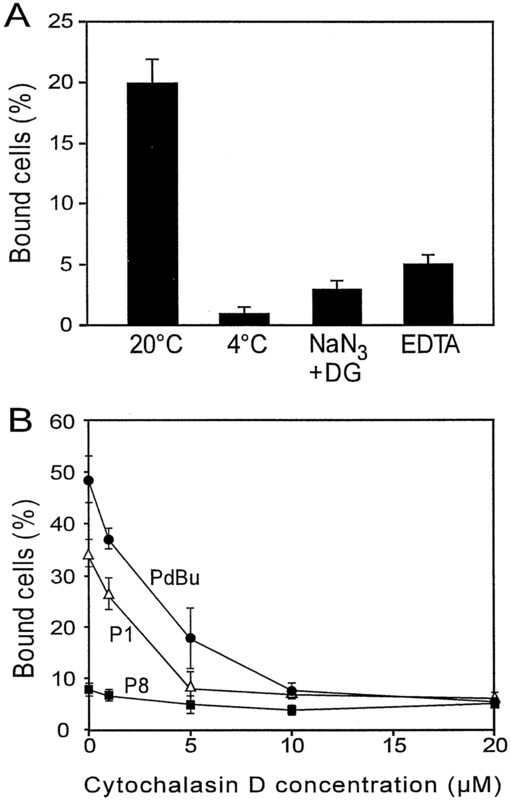 The P1 induced adhesion was dependent on temperature, energy, divalent cations, and an intact cytoskeleton, as it did not take place at low temperature, and it was blocked by a combination of sodium azide and deoxyglucose, by EDTA, and by the actin cytoskeleton disrupting agent cytochalasin D. Even though the adhesion requires a functional cytoskeleton, the P1 induced CD11/CD18 activation itself may not still need it. The P1 induced adhesion was insensitive to inhibitors of PKC and protein tyrosine kinases, suggesting that signaling events involving protein phosphorylation by these kinases are not required for activation of adhesion by the peptide. Petruzzelli et al. (56) have compared two mechanisms of activation of CD11a/CD18, namely inside out signaling by PMA and direct activation by the β2 Ab CBR LFA-1/2. Interestingly, and similarly to our findings with P1, they found that the activation of CD11a/CD18 by the mAb, in contrast to inside out signaling mechanisms, does not require PKC activation or protein phosphatase 2A activity, but it still requires cellular energy. Intracellular calcium fluxes are apparently not involved in P1 induced activation either, as P1 did not increase the cytoplasmic free calcium concentration in Jurkat cells (results not shown). These results do not rule out the possibility that some signals are generated after P1 treatment. In fact, it has been shown that when increasing the migration and cytotoxicity of NK cells, P1 also increases the tyrosine phosphorylation of 150- and 35-kDa proteins in these cells (42). Importantly, leukocyte adhesion to ligands is critically dependent on the concentration of P1. Lower peptide concentrations (50–150 μg/ml) were stimulating, whereas high P1 concentrations (400 μg/ml and over) did not stimulate. It is possible that at lower P1 concentrations the peptide activates integrins by binding to stimulatory sites but that at higher concentrations it inhibits ICAM binding. Inhibition by sulfhydryl groups may also become important at higher concentrations, which is clearly seen in vitro (Table I⇑). The concentration dependence could also explain why P1 inhibited the binding of endothelial cells to purified CD11a/CD18 integrin (22), when it on the other hand very efficiently stimulated the leukocyte adhesion to immobilized ICAMs. To block endothelial cell binding to plastic-coated integrins, 100 μg/ml P1 were needed. Evidently, this amount of peptide is enough to block the adhesion sites on the immobilized integrins, whereas higher concentrations are clearly needed for blocking the stimulatory effect of cellular integrins. Most probably, P1 cannot stimulate the activity of purified integrins, but additional cellular factors are needed. The binding of sICAMs to T lymphocytes was strongly stimulated by P1. The effect of P1 resembles that obtained with Mg2+/EGTA or Mn2+ treatment, which increases the affinity of integrins for sICAM-1 (57). P1 is clearly able to induce a high affinity state of the integrin, but in contrast to the Mg2+/EGTA treatment it did not have the ability to induce the β2 integrin LIBS (ligand-induced binding site) epitopes on T lymphocytes detected by mAb 24 or NKI-L16 (results not shown). These results indicate that P1 induces a different activation state than the other treatments. The efficient activation of integrins by P1 made us consider whether ICAM-2 itself showed similar activity. We therefore produced the ICAM-2Fc fusion protein where the two extracellular Ig domains of ICAM-2 were fused with the Fc part of human IgG1. When these proteins were tested in the adhesion assays, we found that like P1, ICAM-2Fc was able to induce T lymphocyte adhesion to immobilized ICAM-1, -2, and -3. The control protein NCAMFc had a negligible effect. As often seen with proteins vs peptides, the ICAM-2Fc concentrations needed (0.27 to 2 μM) were much lower than the optimal P1 concentration (62 μM). When comparing the abilities of sICAMs to induce the adhesion of T lymphocytes to immobilized ICAM-1, we found that ICAM-2Fc was the most potent activator. ICAM-3Fc also had some activating effect on the T lymphocytes, whereas ICAM-1Fc showed almost no effect. Because sICAM-2Fc has the ability to stimulate lymphocyte binding to ICAMs, it could be expected that immobilized ICAM-2 stimulates lymphocyte adhesion to itself in these adhesion experiments. This appears, however, not to be the case because the background binding of unstimulated cells to immobilized ICAM-1, -2 -and 3 (Fig. 8⇑) and BSA (not shown) was almost the same. ICAM-2 is strongly expressed on endothelial cells and on lymphocytes (10, 11), and these results with sICAMFc proteins suggest that under some conditions ICAM-2 and specifically its P1 region could act as a stimulatory molecule, e.g., during leukocyte rolling on endothelium. Additional activity signals are evidently needed such as those provided by selectins or chemokines. ICAMs have been found as soluble molecules in plasma (16, 17, 18), and these could be physiologically important and not just shed inactive degradation products. The ligand-induced adhesion by P1 is clearly different from that induced by inside out signaling stimulated by phorbol esters or by engagement of the CD3. Phorbol esters act through the activation of PKC, and these compounds as well as stimulation through the TCR induce serine and threonine phosphorylation in CD18 (44) and clustering of leukocyte integrins (58, 59). This is in contrast to P1 treatment, where no clustering of integrins or any increase in CD18 phosphorylation has been observed (22, 40). 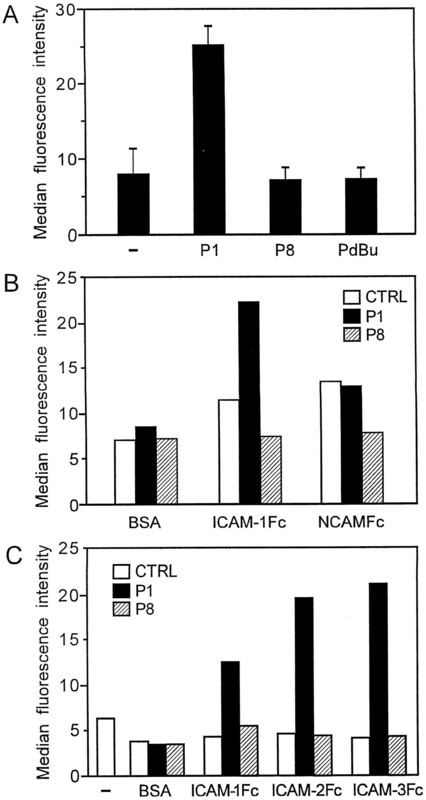 We could confirm the result of Hogg and coworkers that treatment with PdBu did not affect the affinity for ICAM-1 (49). Three possible mechanisms of P1-induced CD11/CD18 activation are presented in Fig. 10⇓. P1 binds to inactive CD11a/CD18 or CD11b/CD18 on leukocytes possibly in a slightly different position than ICAM-1 (Fig. 10⇓A). In Fig. 10⇓B, P1 binding induces a conformational change in the integrin resulting in a high affinity form of CD11/CD18. This change may persist after dissociation of the peptide. Alternatively, P1 generates intracellular signals, and this results in the activation of other integrins on the same cell by inside out signaling (Fig. 10⇓C). In Fig. 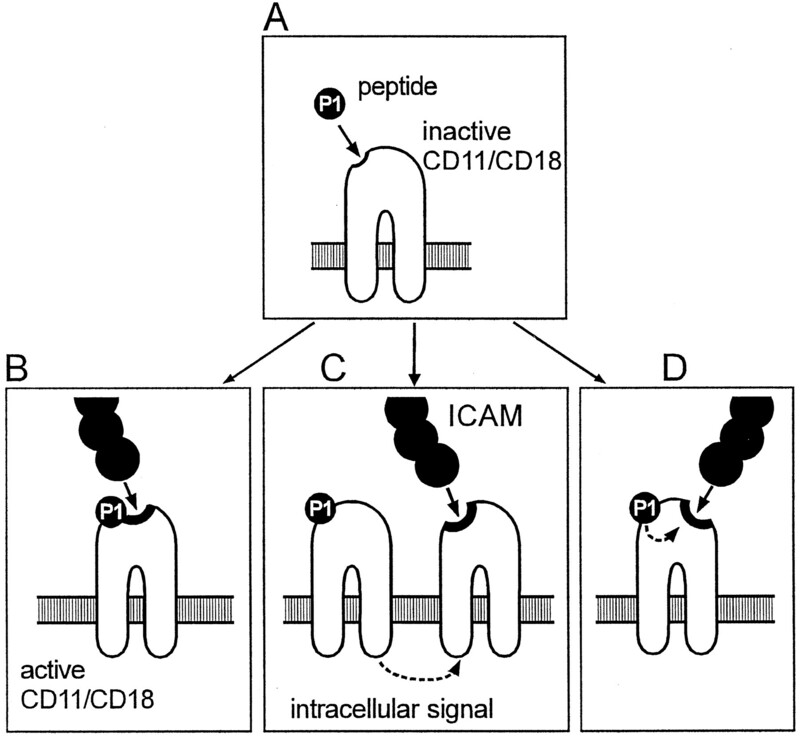 10⇓D, P1 and ICAMs bind to different sites on the CD11/CD18, and the binding of P1 induces a conformational change in the integrins resulting in a high affinity state of CD11/CD18 for ICAMs. Three possible mechanisms for the P1-induced activation of CD11/CD18. After binding of the peptide to CD11/CD18 at a partially overlapping site, a conformational change may take place in the integrins, resulting in high affinity of the binding site for ICAMs (B). Another possibility is that intracellular signals are generated, and other integrins become activated by inside out signaling (C). The third major possibility is that P1 binding activates a separate binding site for ICAMs (D). Our results suggest that intracellular signals are not necessarily needed for the binding of ICAM to P1-activated CD11/CD18. However, the interaction of integrins and ICAMs certainly generates intracellular signals which in turn result in, e.g., cell spreading and migration through endothelium or to the activation of molecules that are not directly bound by P1 such as CD11c/CD18 (42). This finding that a peptide derived from ICAM-2 can stimulate integrin function resembles earlier findings using RGD peptides. RGD peptide binding leads to changes in αIIbβ3, which are associated with acquisition of high affinity fibrinogen binding function and subsequent platelet aggregation. No signal transduction event has been found, but rather the activation appears to be due to a conformational change in the receptor itself. Therefore, in addition to being recognized by the integrin, the RGD sequence serves as a trigger for high affinity ligand binding (60). We thank Aili Grundström and Leena Kuoppasalmi for technical assistance, Yvonne Heinilä for secretarial work, and Drs. D. L. Simmons and W. M. Gallatin for providing vectors and proteins. ↵1 The work was supported by the Academy of Finland, the Sigrid Jusélius Foundation, the Magnus Ehrnrooth Foundation, the Ella and Georg Ehrnrooth Foundation, and the Finnish Cancer Society. ↵3 Abbreviations used in this paper: CD11a/CD18, LFA-1; αLβ2 CD11b/CD18, Mac-1; αMβ2 CD11c/CD18, p150/95; αXβ2 CD11d/CD18, αdβ2; NCAM, neural cell adhesion molecule; P1, synthetic peptide corresponding to amino acids 21–42 from human ICAM-2; P8, scrambled control peptide; PdBu, phorbol dibutyrate; PKC, protein kinase C; sICAM-1, soluble ICAM-1. Corbi, A. L.. 1996. Leukocyte Integrins: Structure, Expression and Function R. G. Landes Company, Austin, TX. Hogg, N., P. A. Bates, J. Harvey. 1991. Structure and function of intercellular adhesion molecule-1. N. Hogg, ed. Chemical Immunology. Integrins and ICAM-1 in Immune Responses 99 S. Karger AG, Basel. Simmons, D. L.. 1993. Cloning cell surface molecules by transient expression in mammalian cells. D. Hartley, ed. Cellular Interaction in Development 93 Oxford University Press, Oxford.